I had somehow reviewd the third season of Grace and Frankie before writing a proper one for the second season for I don't know why reasons. But hey that's the blogging life for you - not everything happens in the right order sometimes. So now I need to back up my enthusiasm for Grace and Frankie's third season and try to remember how I felt about the second season without knowing what had happened in the third. Another quirky fun bit of the unpaid blogging life. But as much as the first season was a delight to watch, I'm pretty sure that it was this second season that firmly cemented my full-on love for the show. The first season had gotten me pretty curious and committed enough to get to the next seasn. But this one? This was just brilliant. And it totally makes you a fan. It would have been so easy just focus on the quirky circumstances that force Grace and Frankie to live together. But now, there's a heck of a lot more story to be told and it's not just about husbands turning out to be gay. 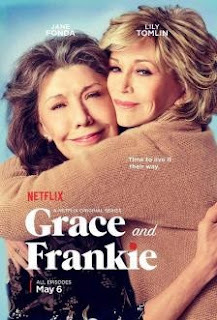 Synopsis: Grace and Frankie is an America web comedy drama series created by Marta Kauffman and Howard J. Morris for Netflix. In it's more recent seasons the show has begun to receive awards nominations and critcial acclaim. So just as Sol (Sam Waterson) was about to admit his affair with his ex-wife Frankie (Lily Tomlin), Robert (Michael Sheen) has a heart attack pretty much suspending this whole conversation for a latter time. And with Robert facing the very real possibility of death, he decides that it's important that they get married in case things take a turn for the worst. As for our titular characters, the big focus is Frankie's homemade organic yam lube that she's now trying to get Brianna (June Diane Raphael) to put into production. Grace (Jane Fonda) is trying to find her place in things but more and more she's constantly being reminded of her age. But things really build up to a most unexpected end in this season. What I Liked: The show somehow balances turning the real and familiar into something tastefully comedic. It's a show that has some pretty serious implications but also manages to make light of it without reducing matters to trivialities. And they're tackling some pretty heavy subject matter at times including relationships among seniors, balancing sexual health with overall health and all that tricky stuff. Jane Fonda and Lily Tomlin only get better in their on-screen relationship that you can totally buy into them being long time friends. Their banter is quirky yet still fluid and on the all appropriately entertaining or surprisingly revealing. Martin Sheen and Sam Waterson made for an equally quirky yet endearing couple who in many ways are still just discovering what it means to be out and proud as gay men afer years of hiding things. And all of their kids add interesting dimensions to the show as well. What Could have Been Better: That said, it wasn't too clear where the writers wanted to go with this season initially. The first half with the sort of focus on the yam lube plot and Sol's infidelity were interesting but not all that great and didn't quite resolve with as much impact as hoped. While things really catch up in the latter part of the season, it takes a while to get there. And with so many supporting characters, not everyone gets their time in the sun. There was naturally a lot of focus on Brianna because of the yam lube storyline but the other kids didn't get quite as much time. I felt most concerned about Mallory (Brooklyn Decker), who really didn't get much done in this season despite it being the second. Coyote (Ethan Embry) naturally got a lot of love but Bud (Baron Vaughn) still felt a little underwhelming despite his job at Sol and Robert's firm. TL;DR: Grace and Frankie's second season takes a little time to figure out its direction but it really builds up to something amazing. The way the season ends is one of the best moments in television I've seen in a while and you can't help but fall in love with their individual stories. And thus the season gets 4 crazy ideas for the lube business from Frankie out of a possible 5.